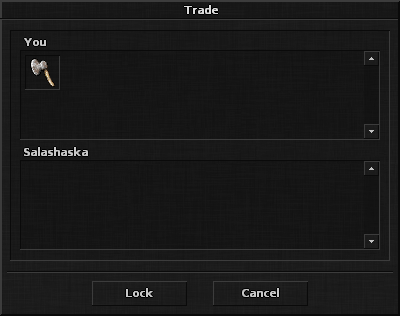 To safely trade items with another player it is a good idea to use the Trade feature. To trade with another player you must be within a short distance from each other. Initiate a trading session by entering #trade playername in the Main chat channel, replacing playername with the name of the player you want to trade with. A dialog as shown below will open up. Simply drag and drop the items you want to trade into the window and lock your offer. Once both you and the trading peer have locked your offers the Accept button is enabled. By pressing Accept the trade is completed, removing your items from your inventory and adding the ones of your peer into your inventory. Before trading it is smart to make sure you have enough space in your inventory - otherwise the items you receive will be dropped on the ground below your character and someone may steal them!